Report calls for new Himalayan development policy; stirs political battle in New Delhi. Ten months after a brutal flood killed thousands of people, leveled riverbank communities, and battered hydroelectric projects across the northern state of Uttarakhand in India’s Himalayan region, a panel of experts has concluded that hydropower development significantly amplified the damage. The committee found that existing oversight practices do not adequately account for how significantly power dams affect the Himalayan gorges where they are being built, and called on India to overhaul its policies and practices for approving new hydropower projects. The 11-member committee recommended the cancellation of 23 hydroelectric projects proposed in Uttarakhand because of the ecological damage they would cause. The report, ‘Assessment of Environmental Degradation and Impact of Hydroelectric Projects During the June 2013 Disaster in Uttarakhand’, was submitted to the Ministry of Environment and Forests on April 16, and made public on April 29. The expert panel was appointed in October 2013 at the direction of the Indian Supreme Court to determine whether Uttarakhand’s hydropower projects influenced the causes and consequences of the flooding that occurred on June 16 and June 17, 2013. Last summer, weeks after the flood, the Supreme Court also ordered a stay on construction and other activities to brng new hydropower projects on line in Uttarakhand. The committee’s findings this week prompted a flurry of legal and political responses. The Court ordered work to stop on 23 of the 24 hydropower projects identified in Uttarakhand in a study two years ago for the Ministry of Environment and Forests. That study recommended cancelling those projects due to the excessive damage to rivers, fish, and land they would cause. The Ministry of Environment and Forests, on May 7, asked the Supreme Court to appoint a new study committee on hydropower and the Uttarakhand flood. The Court responded that they needed more information from the Environment Ministry on why such an appointment was necessary. The findings of Dr. Chopra’s committee also were condemned by the Central Electric Authority and the Central Water Commission, two influential energy development agencies that have helped lead India’s ambitious program to develop hydropower in Uttarakhand and four other Himalayan states. The two agencies added that accepting the study commission’s findings would grievously hamper Indian hydropower development. 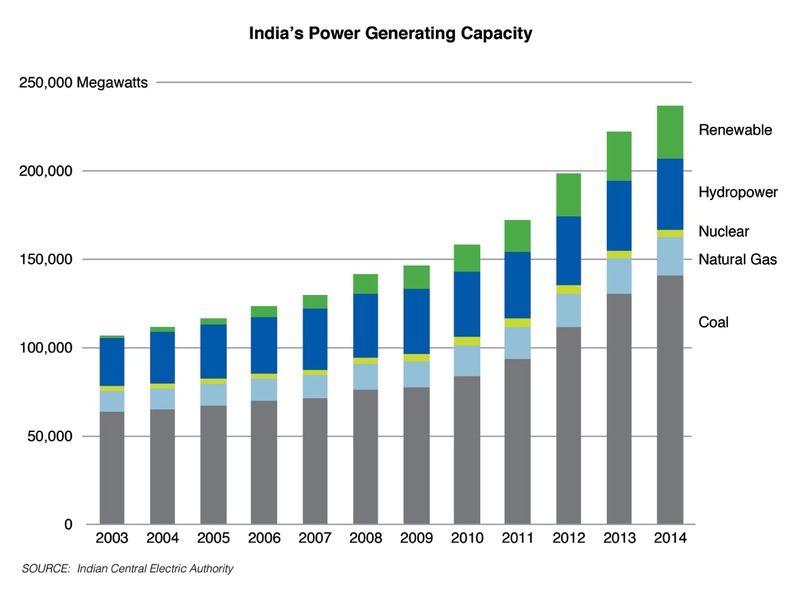 India is counting on hydropower to produce 150,000 megawatts of electrical generating capacity – comparable to 150 big coal-fired power plants. 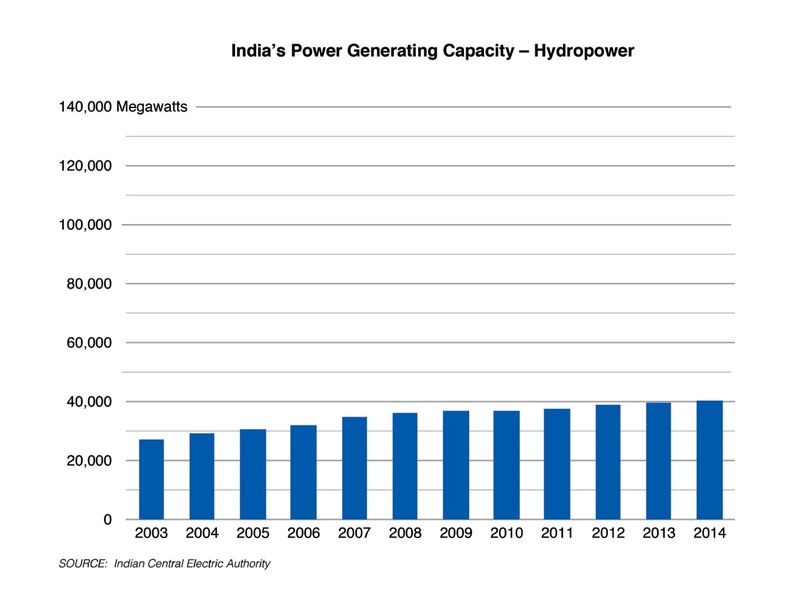 Only 40,000 megawatts of hydropower generating capacity exists in India today. 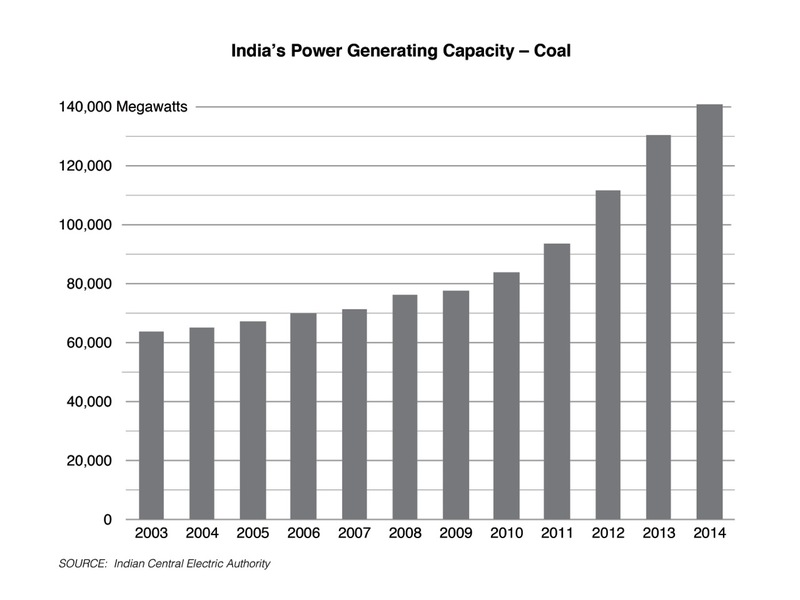 India’s power generation: Hydropower, coal, and total generating capacity.. Click images to enlarge. “Blaming hydro projects for an unprecedented catastrophe and halting construction without any technical or scientific basis will seriously impact energy security,” the agencies said. Since 2003, when India launched a national program to develop more megawatts of electrical generating capacity from hydropower, Uttarakhand has been the most active Indian state for building big and small hydro projects. Fifteen big hydropower projects have been commissioned in the state, 14 others are under construction. Some 39 projects, big and small, are proposed in just two river basins, the Alaknanda and Bhagirathi, according to the Central Electric Authority. 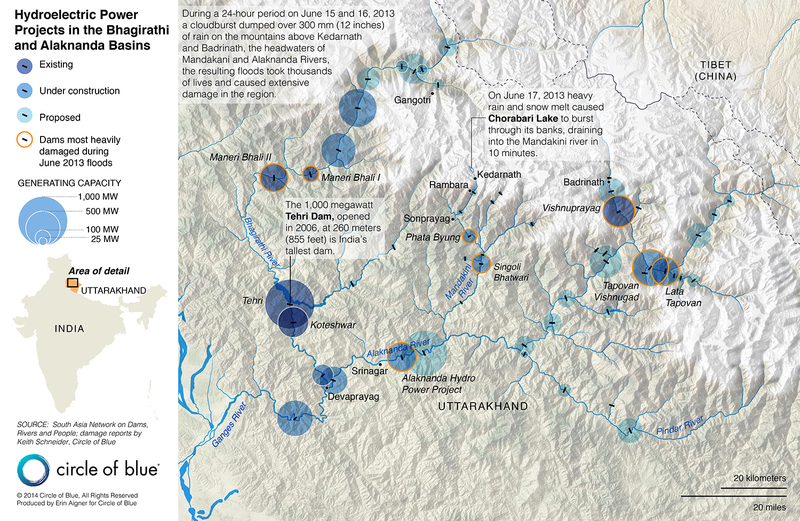 On June 16 and June 17, 2013, following days of torrential monsoon rains, a torrent of water, mud, and boulders roared down the narrow gorges of both river basins. More than 6,000 people died, according to the Indian government, though unofficial estimates put the death toll much higher. The damage to roads, buildings, water systems and hydroelectric infrastructure was so extensive much of it has still not been adequately repaired. The flood washed away 25 small hydro projects, and seriously damaged 10 big projects in both river basins. The Supreme Court-sanctioned study commission concluded that existing hydropower projects aggravated the damage. 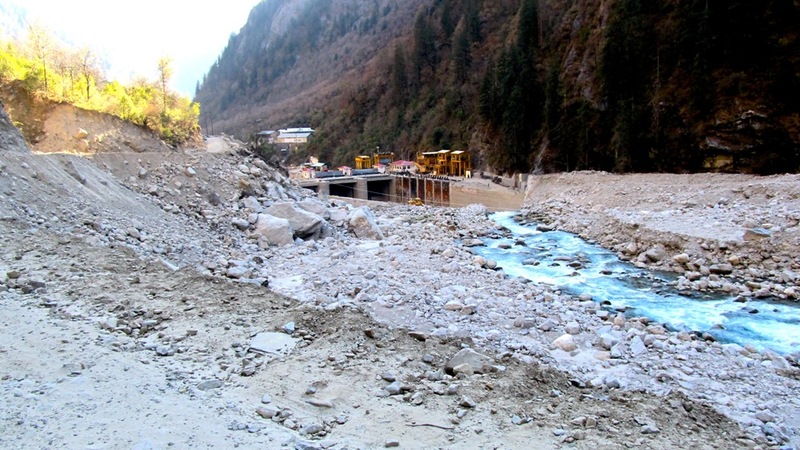 The major reasons, said the commission, were the mountains of silt, sand, and boulders that construction crews excavated to make room for at least 30 big and small hydropower projects, and left unmanaged along the riverbanks. The rushing high water scoured the banks, dissolved the mountains of construction spoils, and pushed the mud and boulders downstream, burying low lying communities. 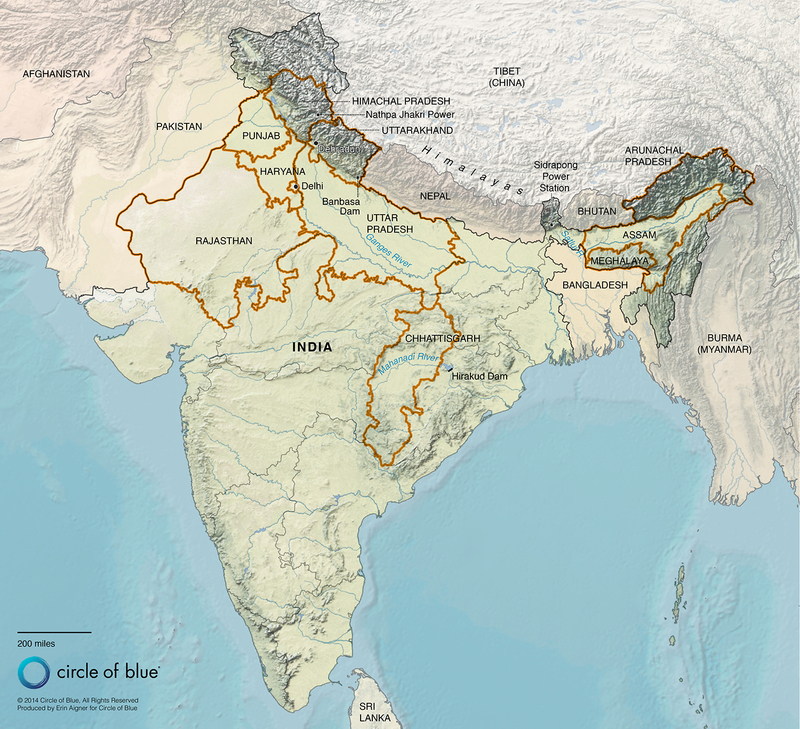 Over the years, community leaders and environmental organizations have worried about the proximity of the spoils piles to Himalayan rivers, warning about the catastrophic consequences of a big flood. This study is the first official Indian government assessment to confirm that spoils piles are hazardous in high water. “The damage was due to a combination of the quantity of flood water and the sediment loads carried by the rivers,” the report said. 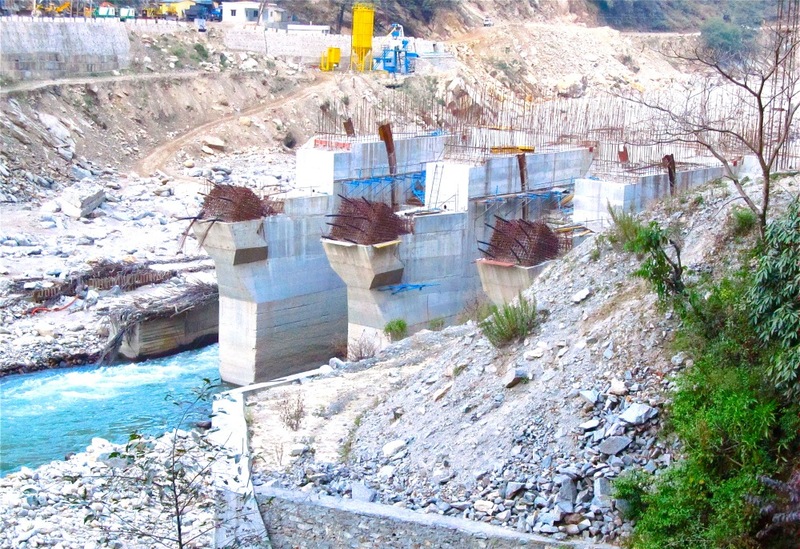 The study commission also scrutinized and confirmed other serious risks from Himalayan hydropower construction. Such dams, said the commission, change river flows, damage fisheries, and can ruin riverine ecosystems. The panel also noted, as did a United Nations climate change study seven years ago, that ponds and lakes formed behind big dams are important sources of methane, a climate-changing air pollutant. The committee recommended that India take a much more comprehensive approach to evaluating hydropower projects. “The cumulative impact of multiple hydroelectric projects along the same river basin and the threat of a cascading chain of catastrophes in the case of structural failure or even from purely natural causes such as the floods of June 2013 suggest that there is an urgent need for a region or entire basin-based strategic environment assessment rather than individual project-oriented environmental impact assessments that neglect the summation effect,” said the report’s authors. India’s insurance companies also are responding to the June 2013 flood. Insurers earlier this year raised the premium for hydropower plants across the Himalayas and other regions of the country. Companies like National Insurance Co. Ltd., United India Insurance Co Ltd., and Oriental Insurance Co. raised premium rates two to fourfold for hydroelectric projects after receiving huge damage claims from hydropower companies like NHPC and Jaiprakash Associates, which operate power plants in Uttarakhand that were seriously damaged by the floods. “Last year’s Uttarakhand tragedy completely changed the risk perception of hydro power plants for insurance companies. In response to tenders of power companies seeking quotation for re-insurance, insurers have asked for double or triple the earlier rates for power projects,” a senior power ministry official told Indian reporters. An executive with National Insurance Co. said it was forced to hike premium rates because building and operating hydro projects in the Himalayas has become riskier. “The projects get damaged every year during monsoons. But damage claims during last two years have risen sharply. 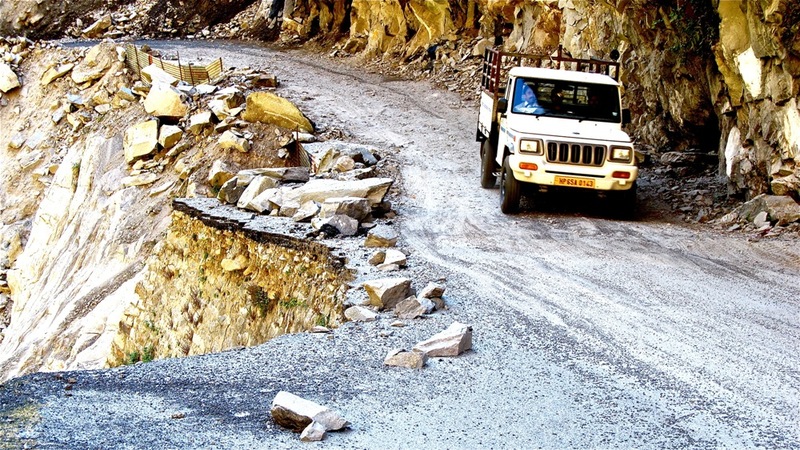 Last year’s Uttarakhand episode has compelled us to change our assessment,” a company executive told reporters. One of the projects, NHPC’s 280-megawatt Dhualiganga hydro station, suffered $US 50 million in damage when its turbines and other equipment in the project’s powerhouse were submerged by the flood. The company recovered a major chunk of the loss through insurance claims. Other hydropower projects sustained higher levels of damage. Read it. Thanks for the insights, Keith. I had no idea. I’m thinking the families of those who died in the flood a year ago are thankful to you for caring enough to follow up on what is happening to this issue now. Good man, you are.